How’s ‘confident and ambitious’ Bentley driving sales in the region? Firas Kandalaft, Head of Marketing and Communications, Bentley Middle East, talks demand for luxury car brands in the region and unveils the marque’s electric car strategy. Low oil prices and global macroeconomic factors are affecting the luxury goods market, including cars, in the Middle East. Given this background, how do you see the performance of Bentley cars in the region? Bentley’s presence in the Middle East is going from strength to strength, particularly after opening the world’s largest single-marque car showroom in the world on Sheikh Zayed Road in Dubai. Last year saw a strong sales performance globally and in the region with worldwide sales of 11,023. And, in the region, we sold 1,239 cars across the Middle East, Africa and India. We have consistently worked hard with Bentley partners to enable long-term growth and continue to ensure our discerning customers receive the highest standards of customer service and after sales care that they rightly expect. Looking forward to the year ahead, we’re feeling confident and ambitious. 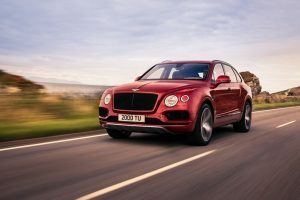 This year will see the world’s fastest SUV – the new Bentayga V8 model – come to the region, as well as the eagerly anticipated Continental GT. In addition, we’ll be welcoming a whole new audience to our luxury brand when female drivers in Saudi Arabia receive their driving licenses. There is a lot to look forward to in 2018. How would you describe your customers in the Middle East? Are they different than those elsewhere? Bentley customers around the world rely on us to provide the very best quality cars and a competitive choice of models, whether they are commissioning a bespoke paint colour or having a headrest embroidered with a unique motif to make their Bentley truly personal to them. The demand for personalisation is particularly pronounced in the Middle East market, with requests for unique colour combinations and one-off designs commonplace across the region. Our customers in the Middle East see their cars as an extension of themselves, much like how their clothes or designer accessories express their personal style. With our Mulliner personal commissioning, we are able to provide Bentley customers with an infinite choice of colour, veneer, leather and paint combinations so it’s possible for customers to design a completely bespoke one-off luxury car which no one else in the world will have. In terms of model choice, we do find that we see a higher mix of Bentayga models in the region. It is the nature of the market here in the Middle East that customers enjoy more room in the passenger cabin, a higher driving position and the capability to drive with confidence on all terrains, which is offered from an SUV. The important factor for us is that we can offer a solution to meet the specific needs of our Middle East customers, while retaining the luxury experience which comes with purchasing and owning a Bentley.